As you know, I’m all about keeping it simple, and more so, using what I have on hand or what needs to be used. 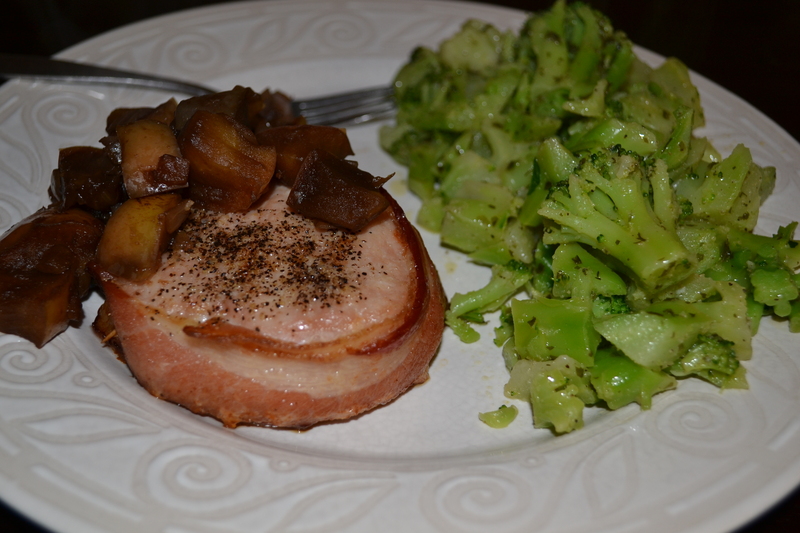 This dinner, is the perfect example of that: Bacon wrapped pork chops with apple balsamic compote, accompanied by garlic buttered broccoli (seen here: http://wp.me/p2zSoO-bk). I’d thawed some thick-cut bone-in pork chops that Seth cut the chop out of (saved the bones for broth, of course), then he wrapped each chop in a strip of bacon, seasoned with kosher salt/pepp and popped them in the oven to bake. In the meantime, we had a not quite crisp apple that needed to be used (there is nothing I hate more than eating a “softer” apple, eeewwww!). We cook with them if this happens. We loosely diced the apple into pieces, and combined it with diced white onion in a little sauce pan with some balsamic vinegar, and let it cook down. We topped the chops with this and it was great! This entry was posted in Recipes and tagged Apple Balsamic Compote, Bacon Wrapped Pork Chop, Easy Meal, Garlic Buttered Broccoli, Paleo, Quick Dinner by livinglikelinds. Bookmark the permalink. mm, this looks delicious! thanks for sharing!